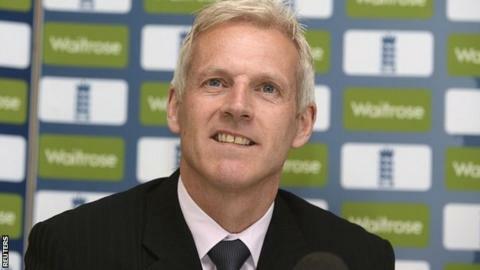 Peter Moores has been confirmed as England head coach for a second time. The Lancashire coach, 51, previously led the national team between 2007-09 but was sacked after being involved in a dispute with batsman Kevin Pietersen. Moores, who took Lancashire to the 2011 County Championship title, succeeds Andy Flower, who resigned in January after a 5-0 Ashes defeat by Australia. "Peter is the outstanding coach of his generation. This is the future," said England managing director Paul Downton. "Things are so delicate around the England camp. At least Peter Moores knows how the system works. "He hasn't played international cricket himself and that was an issue as far as Kevin Pietersen was concerned, that credibility of never having been out there and played Test cricket or one-day international cricket himself, when they fell out in 2009. "But Pietersen isn't there any more and it's a very different England set-up now - new players are coming in and having to work very hard to get over what has happened this winter." "He will return to the role as England head coach with a great deal more experience and understanding of the challenges that the role presents," added Downton, who replaced Hugh Morris as MD and commenced his role in January. "I believe that this is his time." Moores will take charge of England's Test, one-day international and Twenty20 teams, a position one-day coach Ashley Giles had been favourite for following Flower's resignation. Giles lost what proved to be his final match with the limited overs side, a World T20 game against minnows the Netherlands last month, but Downton said: "The defeat didn't cost Ashley Giles his job. "I think this has just come too early for Ashley - but it's by no means the end - I'll be surprised if he doesn't come back and maybe in the future he will be England coach." Others under consideration for the post included Nottinghamshire coach Mick Newell, Sussex's Mark Robinson and former Sri Lanka coach Trevor Bayliss. Downton revealed that "advanced negotiations" were in place to appoint an assistant coach, thought to be current Sri Lanka coach Paul Farbrace, who formerly worked at Kent and Yorkshire. "In the past we have split the roles, but a senior assistant seemed to be the best way forward. I'm comfortable if we can make that appointment it will work well," Downton added. Moores led England in seven Test series, starting with a 3-0 win over West Indies, after replacing Duncan Fletcher as coach before a breakdown in his relationship with then captain Pietersen. A former Worcestershire and Sussex wicketkeeper, Moores was appointed as Lancashire coach in February 2009 on a three-year contract, having previously led Sussex to the County Championship title in 2003. Lancashire had not won the championship outright since 1934 when he arrived. They ended the long wait in 2011 but were relegated 12 months later, bouncing back as Division Two champions last year. "It's exciting," he said of his return to the international arena. "I loved my time the first time round. I would do certain things differently, but I'm looking forward to another go and building for the future. "No one has a right to the job at all. You have to earn that right. "Since being England coach first time I've had five years at Lancashire which I've loved. Coaches have to develop and I think I've done that, and I'm looking forward to bringing that back here. "You learn from mistakes. You develop. I look back at last time and I'm proud of some of the things that happened. But you try and help players as a coach, you learn to help people in a better way. That's something I've got better at over time and can hopefully bring that to the set-up." England Test and ODI captain Alastair Cook was the third member of the panel at the media conference and he said: "For me it's a very exciting time, I've kind of been in limbo since Andy Flower resigned. It's going to be small steps and it's going to take time to rebuild." England's next match is a one-day game against Scotland on 9 May. That precedes a limited-overs and Test series against Sri Lanka, which starts with a Twenty20 match at The Oval on 20 May.